Every now and then I bake cookies. Cookies and coffee is breakfast, so it makes sense to bake them often. And when I don’t bake them some people at home go hungry for breakfast. (It’s just me and my husband at home). 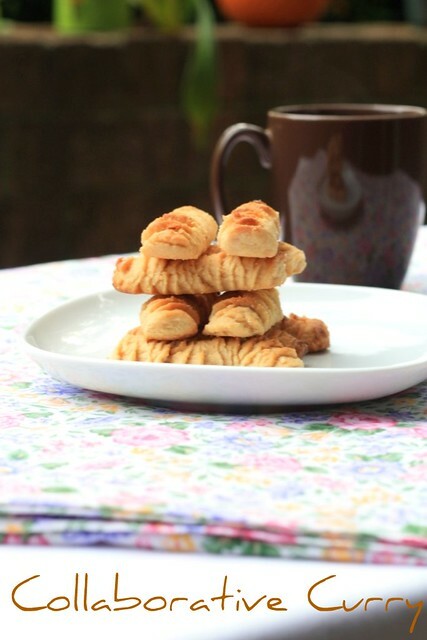 This week is different; we have plenty of peanut-butter cookies to fill our tummies every morning. There is this certain book, which inspired these cookies. Read on for more. I got it from the library last weekend and it is on Swedish cakes and cookies. Beginning with the jacket, the book is delicious. The red and white checkered- jacket opens to reveal pastries, twists, turns (in the name of Danish) and more. I drool over the pages and find a lot of satisfaction just to sit on my couch, on dreary mornings, lusting over cookies. The book is Swedish Cakes and Cookies, published by Skyhorse Publishing Inc. in case you want to take a look at it yourself. thats a nice texture and nice method of shaping cookies. I also bake cookies very often as now that I have stopped buying biscuits. and am bored of those usual shapes ...gonna try this soon. Cute cookies with a different shape. Truly a keeper recipe !! Oooh how wonderful delicious! Lovely! That is a cute and different shape, very novel. Loved the shape of the cookies... very beautiful Sunitha. Tht first pic is awesome...and that design you made on top of the biscuits, how did u get that? Very interesting design n shape..they look super cute n melt in mouth kind..yum! I like the shape of these peanut butter cookies. I eat bread and coffee each morning-I can easily change out for cookies and coffee. Wow, those look really delicious. Nice photographs...and the cookies have a really interesting shape. I love the shapes.. SHall try out this way when I prepare cookies next time..
Looks great. They're very inviting and nice. I would love some for my daily afternoon tea break! 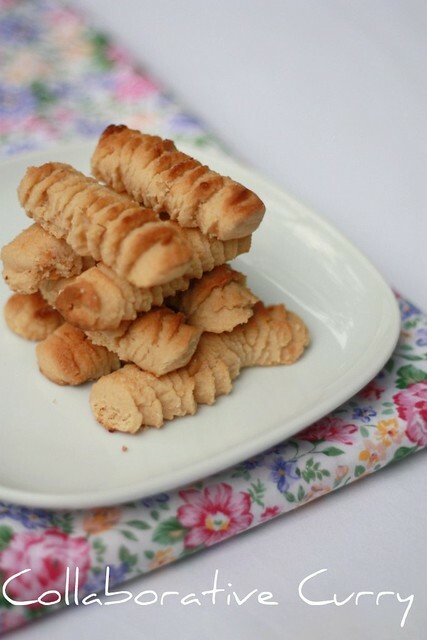 Awesome looking peanut butter cookies, feel like grabbing some..
Love d shape texture n design!! Crisp and yum. Lovely cookies. Thanks you guys for stopping by and your valuable comments. Using a pastry bag, without the nibs, I simply pressed out the dough which was coarse (not kneaded etc.) through the nozzle and let them be in long strips. 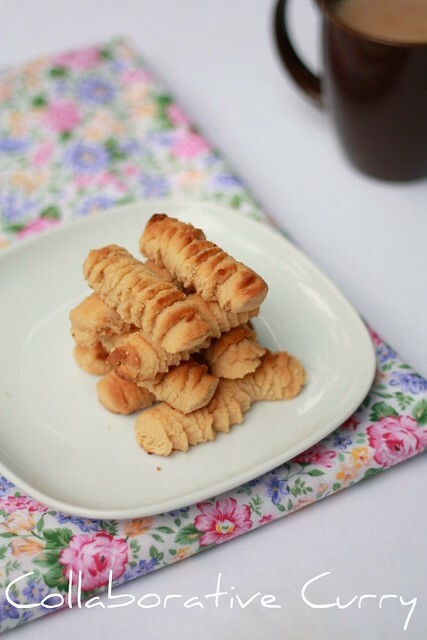 My effort was only to make long narrow biscuits, the ridge was a bonus that came of the experiment. Heartiest Congratulations on wining the Sept DMBLGT...your picture of capsicum filled with vegetable chowmein was very innovative indeed! Wonderful cookies sunitha..Would like to try it sometimes. Love the beautiful shape of the cookies. Congrats on winning the Sept DMBGLIT. loving ur first pic...and texture on the cookies is brilliant! Beautiful cookies! I love the coffee in the background. I have a pot brewing right now, and I just wish I had one of these to dip in it. Cute way to make the shape of the too! Perfect for dunking.